Mr. Rodgers currently serves as a director and chairman of the International Tanker Owners Pollution Federation Fund since 2011. 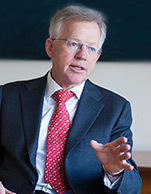 Mr. Rodgers began his career in 1982 as a trainee lawyer with Keene Marsland & Co. In 1984 he joined Bentley, Stokes & Lowless as a qualified lawyer and in between 1986 and 1990 he worked for Johnson, Stokes & Master in Hong Kong as a solicitor. Mr Rodgers graduated in law from the University College London in 1981 and from the College of Law, Guildford in 1982.